Have you ever found yourself in the midst of carving your way through a majority-white space, and wished you had some sort of blueprint, some guidance on how to do it? 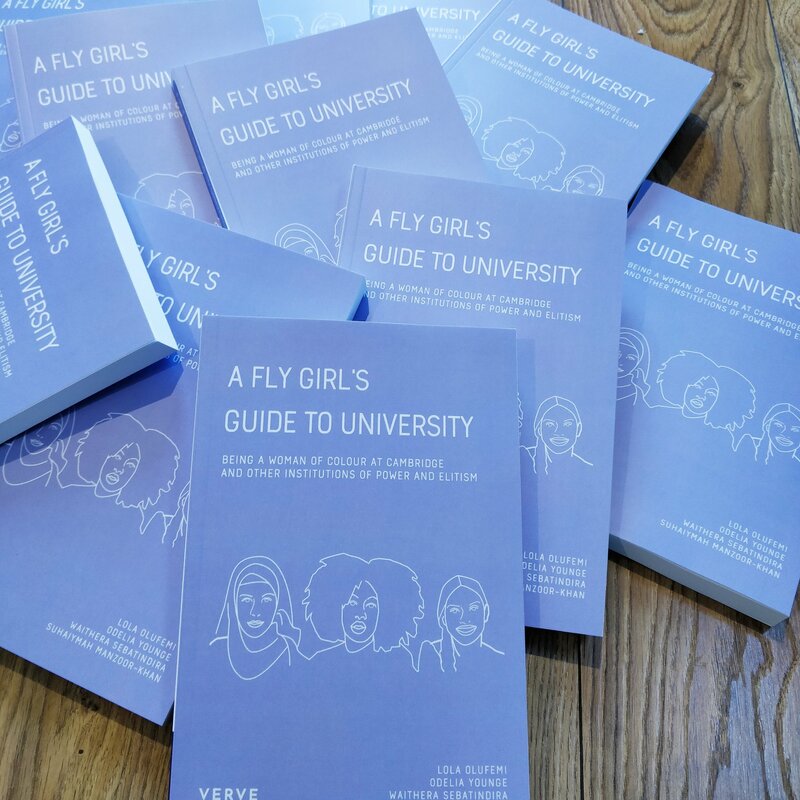 A FLY Girl’s Guide to University, to be published by Verve Poetry Press, will be just that for the thousands of women of colour starting university every year. Written by four women of colour who studied at Cambridge, the collection of memoirs, essays, poetry and prose, functions as what the authors describe as a disruption, an emblem of hope, and a symbol all at once. Importantly, the work demonstrates that as women of colour move through institutions of power, they are very much alive, evolving and strong. The creators, Lola Olufemi, Odelia Younge, Suhaiymah Manzoor-Khan and Waithera Sebatindira, came together through FLY, Cambridge’s network and organising space for women and non-binary people of colour, and when Odelia sparked the idea for a book drawing on their wisdom and lived experience, it seemed vital to follow through and create it. A guide like this did not yet exist, although it was something they all felt they would have wanted when they were preparing for university. gal-dem spoke to the four women behind the project to find out more. gal-dem: What was your experience of being a woman of colour at university? Where did you find joy, and what were the challenges you came up against? Waithera: Racism and misogyny were very easy for me to ignore when I first got to Cambridge. Because of the nature of my school I genuinely didn’t feel intimidated by all the white men’s faces on the walls – it was what I was used to. But being in Cambridge also brought me into contact with women of colour who helped me give voice to my frustrations about the state of these institutions and the way we were treated within them. To me, being at Cambridge as a black woman meant gaining a radical understanding of the world and disinvesting from easy solutions to racism and sexism. Odelia: I believe in the deep love and power of community, and my time in university proved that finding the people who would affirm your existence and your experiences were critical to flourishing in those spaces. I love that black women know how to do that for each other, and I have also found that type of camaraderie in wider spaces of women of colour. What I found difficult were the many times that I was the sole voice shedding light on the experience of someone like me in a room. How often I had to address narratives that refused to let me be included. It was very tiring, and I sometimes longed for spaces where things felt easier – where I could start at the point of revolutionary change instead of simple understandings of history and systems. What was the most important thing you learned from your experience at university? Suhaiymah: I think one of the most important things I learnt being a woman of colour at university was how much I needed to believe in myself, and validate my own experiences if no one else would. When so few people share your positionality and experience I think it’s easy for them to dismiss, reject and essentially erase what your reality is. Lola: I learnt that the only meaningful way to exist in the university as a student is to try and change it. To use the knowledge it gives you against it and redistribute its resources to the local community; we have to oppose the idea that the university as the only valuable site of knowledge production. What do you hope this book will do? Waithera: It’s a cliché but I hope the book will encourage people to be themselves. Specifically, I want women of colour to realise that in their first few days, weeks, or even months they might be surrounded by people who (despite growing to love them) might never really understand them, but that there are pockets of people across the university who will. I want the book to make these women proactive in finding spaces for themselves and, if they can’t find them, carving them out themselves. Suhaiymah: I hope the book can be a sort of big sister putting her arm around you and saying she understands, you’re not alone, you matter. But I hope it also explains how Islamophobia functions through university policy; how feminist campaigning has to hold the institution to account; and how employment rights, body autonomy, sexual harassment policies, racism and lack of critiquing curricula are all linked. In that sense it is both an intellectual and activist effort to mobilise people on their way to, or in, or who previously attended university. If my going through some pain or difficulty can ease it for someone else then it is worthwhile sharing. Sharing what we experienced and and the knowledge we gained is also, to me, a way of acknowledging what happened. The histories of women of colour are so erased and dismissed and destroyed that in many ways sharing our work, our analyses and our experiences is a form of archiving, so in 30 years’ time when this discussion is looked back on, our labour cannot be ignored. What do you think most urgently needs to change in universities across the UK, particularly with regards to improving circumstances for women of colour? Waithera: Universities need to stop using the presence of active women of colour on their campus as evidence that they’re “good on race and gender” and actually consider our needs. Universities cares more about appearing to support us than actually supporting us, and that needs to change. Lola: Marketisation is destroying higher education. In less than a decade it has managed to convince us that all that matters is graduate earnings and getting your money’s worth from your Friday lecture. This matters for women of colour because it’s us that score the lowest on racist and sexist metric systems and our research that is deemed “too damaging to the university’s reputation” to receive funding. Any future where we can begin to think about improved conditions for women of colour means university education must be free, fully accessible and have an ethics of care embedded in it. We need to fight for the rights of low paid workers who are disproportionality women of colour instead of seeing ourselves as separate from them. We also need more women of colour entering the institution with radical agendas, and support systems that ensure that they aren’t alienated by the racism and sexism that awaits them. If you wanted women of colour starting university to know one thing, what would it be? Lola: I learnt more from my involvement in activism, teach-outs, rallies, events and protests than my degree could have ever taught me. I want other young people to know, especially young feminists, that the education you receive at university can transform the way you think about the world. Seek out the things you want to learn – you may not find a radical education inside the classroom but you will find it in student activist groups, artists, anybody engaged in or thinking about resistance work. Odelia: My advice for those starting university now: you have the makings of everything that you need. When I remembered that, and embraced the unique ways I was already navigating the world – for myself and for others like me – is when I was able to get everything that I wanted out of my university experience. It helped me find the people who I needed to find, and learn the things that I need to learn. Suhaiymah: That experiential knowledge has truth to it that doesn’t require the validation of others. You are never the only person experiencing racism or misogyny or misogynoir or islamophobia – when you find others not only are you validated but through that validation you are able to then collaborate and mobilise, and start working to change the broader situation. Seek out spaces and people who will understand those experiences, because you are never alone. A Fly Girl’s Guide To University is now available to order here. You can attend a launch for the book in London, Birmingham and Cambridge.